When a couple of friends in Seattle told me there was a basketball game with Jamal Crawford and a crew of Seattle all-stars taking on Baron Davis and a crew of NBA guys from L.A., it didn’t take me long to say yes. When a couple of friends in Seattle told me there was a basketball game with Jamal Crawford and a crew of Seattle all-stars taking on Baron Davis and a crew of NBA guys from L.A., it didn’t take me long to say yes. It didn’t even matter who exactly was playing. Seattle is one of the most enjoyable cities in the country, Jamal Crawford’s Pro-Am is great, the Drew League is great, and … yeah. Of course this had to happen. I had to go. Here are 10 lessons from Friday night in Seattle. 10. Zach LaVine is the best dunker since Vince Carter. … and that turned into a windmill in the layup lines around 7:45 Friday night. That’s how things really got started. And it wasn’t even LaVine’s best dunk. He got hit in the air about 5 feet from the rim and just kept floating until he dunked. The crowd rioted. Video doesn’t quite do justice to the degree of difficulty, but it’s here if you’re curious. What’s wild about watching LaVine is how easy he makes it look. He can already jump 10 inches higher than anyone else, but he’s also got the coordination to finish like it’s nothing. LaVine is the guy who can finish an alley-oop with a windmill dunk and make it look like a layup. That’s what puts him in a category with Vince Carter. Nobody since Vince has been able to make dunking look this fluid. Coming into Friday night, I wasn’t sure if LaVine would ever turn into a good basketball player. Coming out of Friday night, I realized I’ve been an idiot for caring. Just let Zach LaVine dunk for the next 10 years and nobody will have any complaints. 9. Not everyone is built for summer basketball. If LaVine is everything you could want out of summer league — 75 percent dunks, some 3s sprinkled in, and absolutely no defense — there are others who don’t quite fit the mold. Like Trevor Ariza. Great guy, very good career thus far. But when your chief skills are corner 3s and defense, you might as well not exist in summer league basketball. Oh, you’re great at rotating on screens? Cool. Nate Robinson just shimmied through three people for a 360 layup and he’s been doing the Nae Nae at half court for the past 30 seconds. Like Ariza, the whole Drew League team was overmatched for most of the night. Because of a few key no-shows, they didn’t have the talent and just couldn’t keep up with Seattle. Bobby Brown is a summer league legend who will strike fear into anyone, but Dorell Wright launching 3s wasn’t going to get it done, especially not in a hostile environment. This game was close for three quarters, but when Seattle finally broke things open late in the third, it felt like it’d been coming since the opening tip. 8. 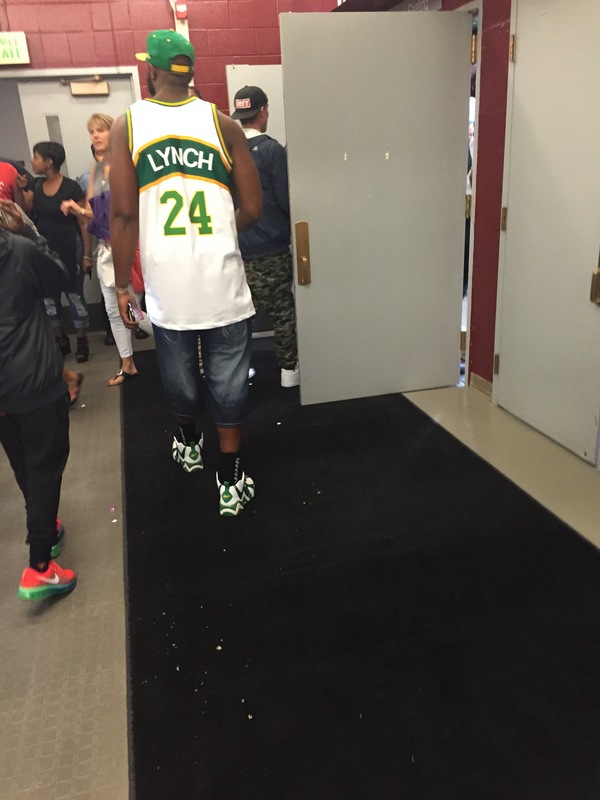 The spirit of the Sonics will never die. 7. Someone needs to start selling this jersey immediately. Seriously, who wants to get rich? Mass-produce that jersey right now. This led to another 15 minutes of unquotable descriptions of Clay Bennett, Howard Schultz, and David Stern, all of whom definitely earned the lifelong scorn they’ll have in this city. The rant then flashed back to 2007, when my friend was kicked out of KeyArena for heckling LeBron James. He wasn’t cursing, just playfully screwing with LeBron for being flat-footed (while LeBron destroyed the Sonics), before the ref turned around in the third quarter and told him to leave. He turned to then-owner Schultz, seated down the floor, and appealed to him for justice. Schultz made eye contact and then just turned his head. Metaphor! I didn’t really believe his claims of innocence until he told me the best part: He recognized the ref who kicked him out a year later, when Tim Donaghy popped up on ESPN. He remembered his face exactly. So … who do YOU trust? My friend, or Tim Donaghy? In any case, this is what the NBA is missing with no team in Seattle. There’s nobody to heckle LeBron for being flat-flooted. 6. Never count on summer league rosters. Summer basketball is a little bit like underground music. It thrives online and grows through social media, with a steady stream of rumors to help build hype for any new game/artist. 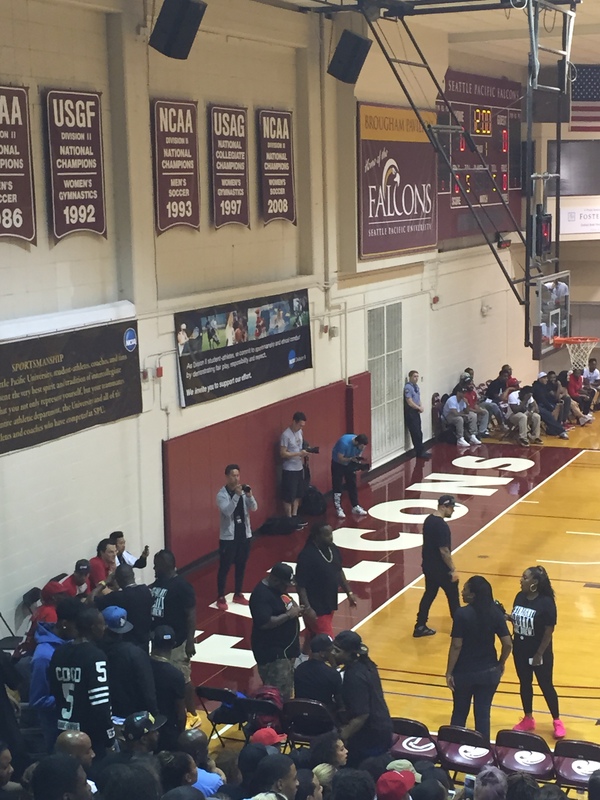 The Drew League–Seattle Pro-Am game was no different. The original rosters had the Drew League showing up with James Harden, Klay Thompson, and DeMar DeRozan. A good rule of thumb for these things is to take the number of stars expected and cut it in half — especially if they have to travel. By game day, Klay was still in China, DeRozan was MIA, and despite rumors that he was definitely in Seattle and ready to play, it turns out that Harden had stayed in L.A. for Russell Westbrook’s wedding. In Napa getting lit with friends and family at Goose and Gander. What a wonderful place! Love it! 5. Nate Robinson really does look like the kid from Role Models. Some context to that photo: Spencer Hawes easily had the best nickname of the weekend (“The Spence Needle”) and he was the only decent big man for either team. Aside from finishing wide-open looks from Jamal Crawford (announcer: “The Neeeeeeeeeeee-duhhhhhhhhhlllllll!”), he also attempted a leaning, pull-up 3 that was so awful I still love it three days later. He finished his night with a fantastic layup that was sorta like George Mikan trying the Dream Shake. Great night all around. As for Nate Robinson, that thing from the above Ariza section actually happened, and the biggest tragedy of the night is that nobody caught Nate dancing on video. Also, on Saturday, I went to Rainier Beach and tried Nate’s Wings and Waffles. The Nate’s Special (grilled cheese stuffed with chicken strips and mystery sauce) was delightful, and the chicken-and-waffle sliders received positive reviews as well. Nate Robinson is better than Michael Jordan (at restaurants). 4. Baron Davis in Dad Mode is beautiful. The most inspiring performer of the night was Baron Davis, who arrived as team captain of the Drew League. He went through warm-ups rocking a David Foster Wallace bandanna, and then proceeded to rest himself for the entire first half while Bobby Brown, Ariza, and Dorrell Wright kept the Drew alive. This allowed him to build suspense, and when he entered in the third quarter the whole crowd went crazy. He made a couple of nice plays, and played for exactly three minutes before the game got out of hand. Then B. Diddy decided he was done for the night. It was an inspiration to lazy people everywhere. 3. Isaiah Thomas in God Mode is beautiful. It took about five minutes of basketball for his prophecy to be realized. First, Thomas lined up Stanley Johnson and destroyed his ankles on the way to the rim. Ninety seconds later … WHAT? 2. Seattle has a type. Someone needs to go to grad school to study this. Basically, any shoot-first guard who’s twice as fun as anyone else on the court and/or gives his coach an ulcer probably has ties to Seattle. I didn’t realize how badly I needed to see a lineup with Jamal Crawford, Nate Robinson, and Isaiah Thomas until it happened. I called them Team Four Loko: Crawford pulling up from 35 feet, Robinson throwing himself at the rim for reckless putback-dunk attempts, and Thomas weaving through four defenders at a 45-degree angle, somehow popping up with a clean look at another layup. You know how some people talk about the Spurs like they’re some kind of spiritual triumph for basketball? Team Four Loko is my spiritual triumph. Or, it definitely felt like that on Friday. 1. It’s Jamal Crawford’s game. The Seattle Pro-Am, first organized by Doug Christie, began in 1996. Crawford played as a high-schooler. He eventually took over the league and began building it into an attraction for NBA players from all over — bringing in Blake Griffin, Kevin Durant, and Kyrie Irving over the years — while also including a shocking amount of local NBA talent. So many players — Terry to LaVine to Martell Webster to Brandon Roy — have Seattle ties, and as the family has grown, Crawford’s role as the patriarch only becomes more impressive. Games like this definitely aren’t happening in Oklahoma City. 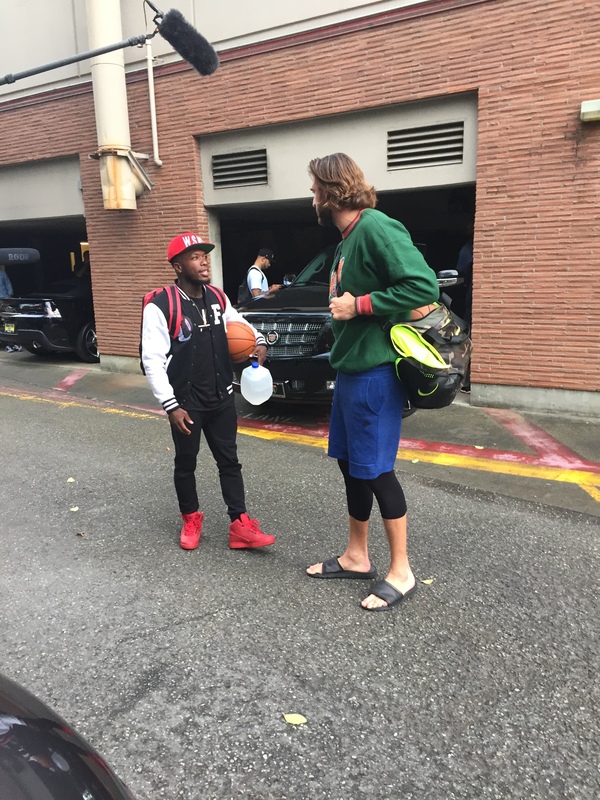 With the Sonics gone, Crawford has made sure that the NBA never fully leaves Seattle. So let’s end this with Crawford welcoming Stanley Johnson to the city. Johnson fought on D all night, but this was almost like hazing. His defense just made him a perfect foil for the Seattle guys. This particular exchange began with about 22 seconds left in the third quarter, and the announcer got everyone on their feet while Crawford went back and forth, 40 feet from the rim. This was going to end only one way. Look at Johnson go for the steal halfway through while Crawford just shakes his head. He drained that shot with about eight seconds left to break the game open for Seattle. Then, after a foul put the Drew on the line, there was a chance at a last-second shot to finish the quarter. Poor Stanley Johnson. He did his best.